This past weekend happens to be one of our favourites in terms of Nigerian celebrity style delivery. Guessing April is that time of the year when most celebrities are starting to get their style act together in anticipation of the summer months. Not sure what the exact reasons are for the change but it’s safe to say 2019 fashion has officially taken off. We have curated the 10 best celebrity styles we spotted this weekend and we can bet our last eyelash that you’ll love these looks. 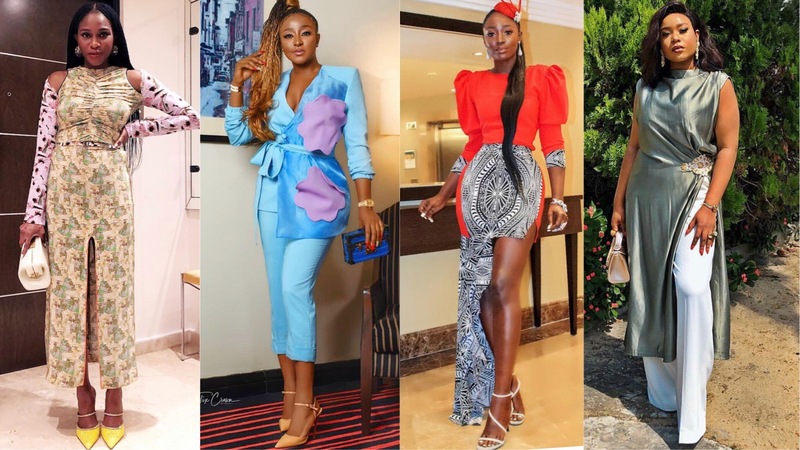 All credit to designer Julyet Peters for star girl, Ini Edo’s major slay. The gorgeously detailed suit set was paired with a Louis Vuitton purse and Louboutin shoes for a chic contemporary wedding guest look. Talk about a winning combination. Wearing a design by her own fashion house, Tolu Bally stepped out to a wedding looking completely fabulous and the fascinator as an addition to the look made it even more spectacular. What’s better than one Style Raven? You know it: two! The Ikeji sisters looked delightful in their contrasting style. Linda served casual fabulosity in her signature monochrome palette while Laura opted for an oh-So-SR look that has us clapping like a proud mama. Wearing a top from BxFrox and pants from bestie FabLane by Derin, TV girl Mimi Onalaja has just shown us why we should take metallic pieces a little more seriously. When you are styled by one of the best in the game, you will step out like a ray of sunshine every time. Mimi Yina of Medlin Couture again styled our favourite ‘mama di mama’ this weekend and we are back to loving candy stripes. Styled by Dhamola, Toni Tones totally showed out in this monochrome look as the style baddie that she is. The look, although a throwback, is one that is so stunning and so inspiring. In her own design from the Studio Collection 1 released in January, Lisa Folawiyo surely had a fantastic day wearing this fun mix-print design. Nimi knows how to make you want to be minimalist. After a little break from the gram, the socialite is back to give us more lessons on why she is fabulous. This is an affordable combination that is just so much fun. The wide-leg pant paired with a blazer never gets old and fashion entrepreneur and influencer, Olarslim knows just how to accessorize the look to perfection. But we’re curious about her choice of shoes.